The following is a call to take part in the second annual and week long, Institute for Advanced Troublemaking summer school, happening in July, in Worcester, MA. 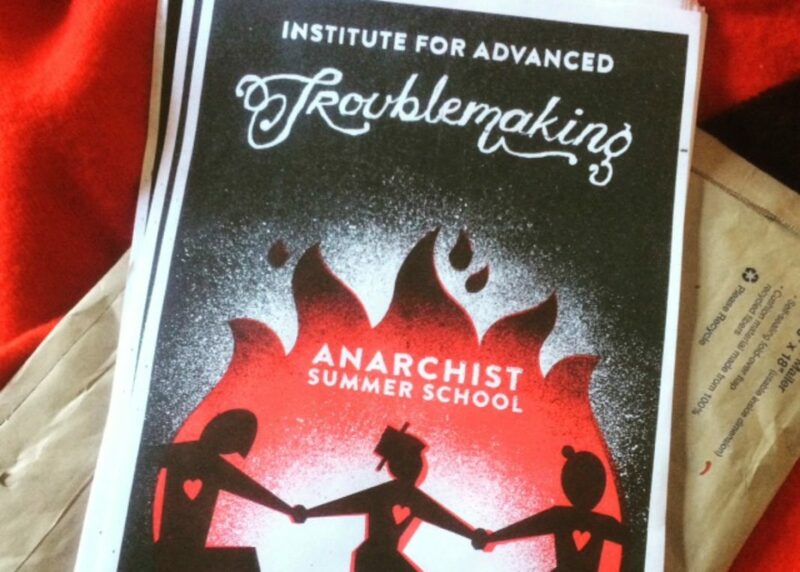 The second annual Institute for Advanced Troublemaking (IAT), a weeklong anarchist theory and action summer school for adults of all ages, kicks off July 21 to 29, 2018, in Worcester, MA. Below you’ll find the majority of the courses/workshops and talks (listed in alphabetical order) that will fill the week during this year’s Anarchist Summer School. We’ll likely be adding one or two more talks. The schedule will also include time for opening/closing/morning circles along with shared meals, DIY skills shares, a night walk, swimming, campfires, and other socializing and fun. Applications are due before or on our favorite anarchist holiday, May Day. For the online application, see: https://advancedtroublemaking.wordpress.com/apply-to-attend/. Zola is a street artist and community organizer. She was involved in the Quebec student movement for ten years, and has evolved between the Francophone and Anglophone realms of anticapitalist and antioppressive politics of Montreal since then. In the past years, she has focused her time mainly on popular education around settler colonialism and indigenous solidarity through direct action and art. Anne, Jack, Koala, Shane, Sherrie! The direct action track is put on by folks from across the East Coast(ish) who have been trainers and schemers in a wide array of struggles, including environmental, animal rights, antiracist, indigenous, and antifa movements. They prefer to be purposefully vague! Jack is a super scoutlord. Koala is a marsupial. Sherrie, Anne, and Shane are part of the FANG Collective, which takes an intersectional approach to stopping the expansion of fossil fuel infrastructure in the Northeast and doing solidarity with liberation movements. They are a loose affinity group of leftists who have all organized together in a multitude of capacities including at the Stone Soup Community Center and FemSex Worcester. They have all done work as sexual health educators, and have been present to their community for processes around consent and accountability. This group has as many questions as answers, but is working to facilitate a world with less patriarchy and pain along with more joyful, liberatory practices of love. Previous PostPrevious Gun Control? No, Youth Liberation!